for digital innovation & transformation. Education SPARX Enterprise Architect & ArchiMate 3.0 for a defining a general Architecture approach. The BMC / Business Model Canvas and the VPC / Value Proposition Canvas. Workshop CMMN / Case Management Notation. We can provide all of are Clients with In-House Courses at your company or at another location in any form - to suit your needs. The Course can also be a combination of different courses. Training course actively engages attendees in a set of practical learning activities and enables the most effective acquisition of knowledge and skills required to use ArchiMate® 3.0 language. We work with Multimedia presentations, group exercises and discussions, practical and personal workshops, case studies. Contact us for a proposal of a 1 - 2 day Workshop or an Education traject. 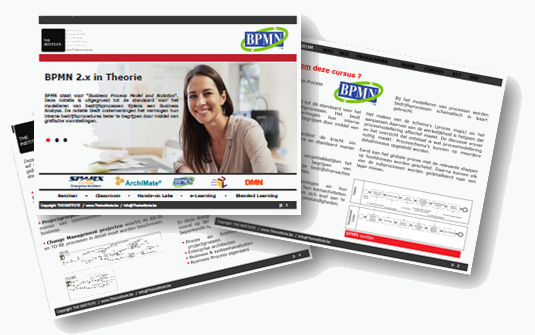 BPMN is an international standard established by OMG®. The standard describes the graphical language for Business Process modelling. This Course is designed to provide candidates with a high quality learning experience based on the application of BPMN concepts in Business Process modelling. BPMN will provide businesses with the capability of understanding their internal business procedures in a graphical notation and will give organizations the ability to communicate these procedures in a standard manner. Furthermore, the graphical notation will facilitate the understanding of the performance collaborations and business transactions between the organizations. This will ensure that businesses will understand themselves and participants in their business and will enable organizations to adjust to new internal and B2B business circumstances quickly. The aim of BPMN is to provide a standard notation that can be understood by all business stakeholders in a business, including both technical and business users, yet in a form that is able to represent complex process semantics. Business stakeholders include the business analysts who develop and update the processes, the developers responsible for the technical implementation of the processes, and the business managers who monitor and manage the processes. Training course actively engages attendees in a set of practical learning activities and enables the most effective acquisition of knowledge and skills required to use BPMN 2.0 language. BPMN is part of the triple crown of process improvement standards: BPMN, CMMN and DMN. CMMN is an international standard established by OMG®. The standard describes the graphical language for Case modelling. This Course is designed to provide candidates with a high quality learning experience based on the application of CMMN concepts in Case modelling. Case Management Model and Notation / CMMN defines a common meta-model and notation for modeling and graphically expressing a case as well as an interchange format for exchanging case models among different tools. CMMN is intended to capture the common elements that case management products use, while also taking into account current research contributions on case management. Known as an Adaptive Case Management, CMMN aids in the decision making process through suggestions, yet keeps humans firmly in the driver’s seat. CMMN is centered around living information and relationships, while traditional business processes are centered around a-priori defined activity sequences. This specification defines a common meta-model and notation for modeling and graphically expressing a Case, as well as an interchange format for exchanging Case models among different tools. It is to Case management products what the OMG Business Process Model and Notation / BPMN specification is to business process management products. This specification is intended to be consistent with and complementary to BPMN. Training course actively engages attendees in a set of practical learning activities and enables the most effective acquisition of knowledge and skills required to use CMMN 1.1 language. DMN is an international standard established by OMG®. The standard describes the graphical language for Decision modelling. This Course is designed to provide candidates with a high quality learning experience based on the application of DMN concepts in Decision modelling. 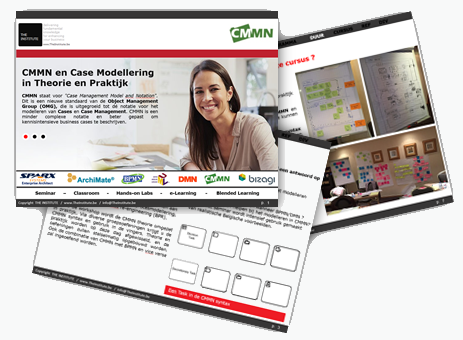 DMN is designed to work alongside BPMN and/or CMMN, providing a mechanism to model the decision-making associated with processes and cases. While BPMN, CMMN and DMN can be used independently, they were carefully designed to be complementary. Indeed, many organizations require a combination of process models for their prescriptive workflows, case models for their reactive activities, and decision models for their more complex, multi-criteria business rules. Those organizations will benefit from using the three standards in combination, selecting which one is most appropriate to each type of activity modeling. Training course actively engages attendees in a set of practical learning activities and enables the most effective acquisition of knowledge and skills required to use DMN 1.1 language. 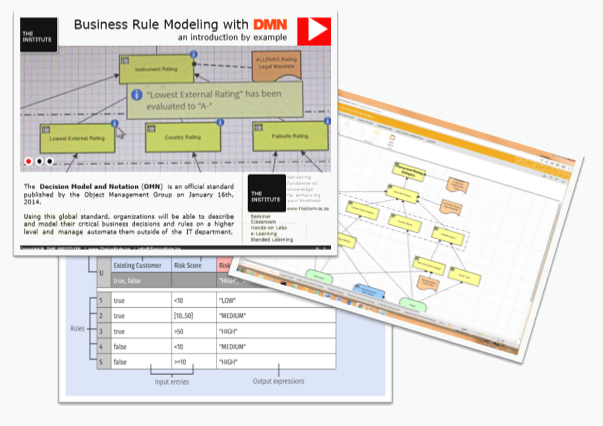 DMN is part of the triple crown of process improvement standards: BPMN, CMMN and DMN. 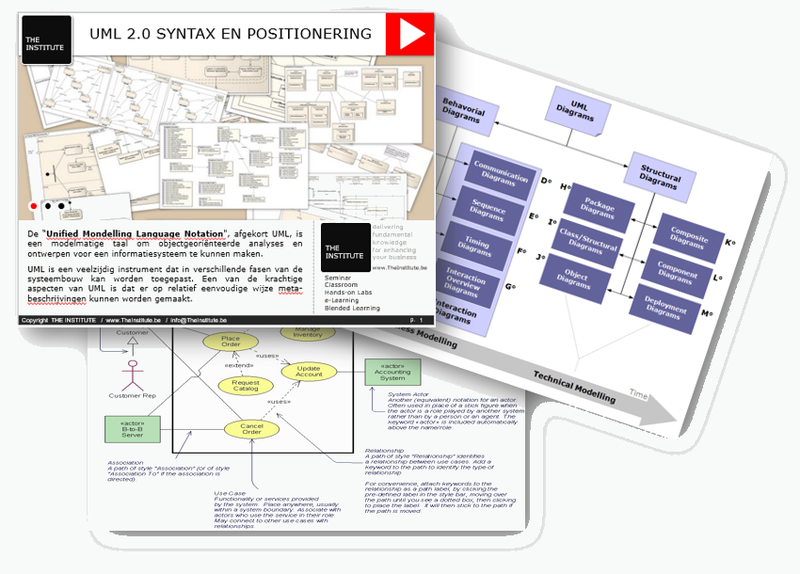 UML / Unified Modeling Language is an international standard established by OMG®. The standard describes the graphical language for Functional Analysis. With UML you can zoom out from a detailed view of an application to the environment where it executes, visualizing connections to other applications or, zoomed even further, to other sites. Alternatively, you can focus on different aspects of the application, such as the business process that it automates, or a business rules view. The new ability to nest model elements, added in UML 2.x, supports this concept directly. Training course actively engages attendees in a set of practical learning activities and enables the most effective acquisition of knowledge and skills required to use UML 2.x language. Sparx Systems Enterprise Architect is a visual modeling and design tool. The platform supports: the design and construction of software systems; modeling business processes; and modeling industry based domains. It is used by businesses and organizations to not only model the architecture of their systems, but to process the implementation of these models across the full application development life-cycle. Enterprise Architect is the solution to visualise, analyse, model, test and maintain all of your systems, software, processes and architectures. Enterprise Architect is the ideal platform to help you to stay in control of your workspace, support your colleagues and team, enable collaboration and build confidence within your most complex projects. With built-in requirements management capabilities, Enterprise Architect helps you trace high-level specifications to analysis, design, implementation, test and maintenance models using ArchiMate, BPMN, CMMN, DMN, UML and other open standards. We use the principle 'we have already done it'. From our experiences we give our customers an optimal service for their needs. Thank you for your interest in THE INSTITUTE. Please fill out the form below to ask a question or report / question about software license and we will answer you message ASAP.